The Galaxy S5 already looks like a nice piece of hardware, but Samsung is throwing some free services and subscriptions into the mix to further entice buyers. The manufacturer is bundling everything from fitness to productivity apps to the tune of nearly $600 in free extras when you buy the phone. Box lets you store, manage and work with all of your files and documents across pretty much any platform, including the Web, desktop, and Android(s goog) and iOS(s aapl) devices. The Galaxy S5 gets you 50GB free for 6 months (worth $60). Run Keeper is a great fitness app that primarily tracks your runs. It measures your performance over time and lets you share your results with friends. Galaxy S5 users get 1 year of free premium service (worth $20). An interactive multimedia app with the latest news and stories from the Wall Street Journal. 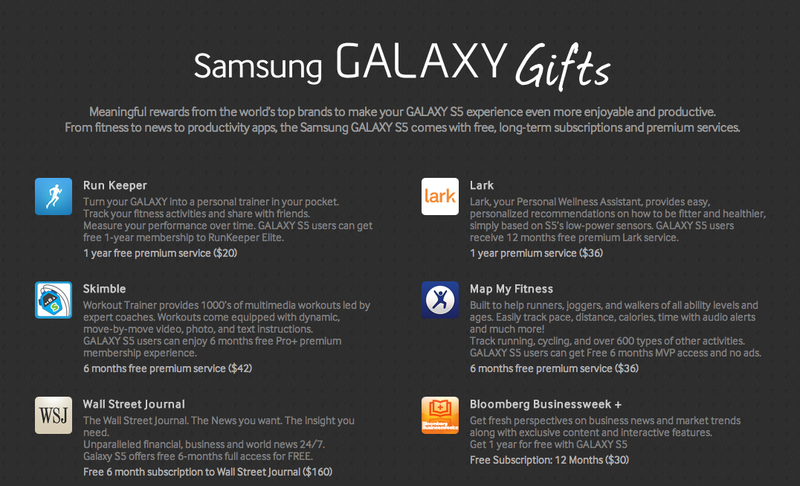 (s NWS) A free 6-month subscription for Galaxy S5 owners is worth $160. You’ll have to pay if you want to continue using these apps after your free subscription expires, but I’m certainly not complaining about half a year of free access to the Wall Street Journal (or a full year to Bloomberg Businessweek+, also included). Many of these apps and services are already available for other devices with a free component, though in most cases you’re getting more time for free here. Samsung also bundled a bunch of free software recently with its Galaxy Note 3 “phablet” and Galaxy Note 10.1 tablet. Other manufacturers have been offering similar free bundles as well, and I don’t see this a trend that’s likely to stop anytime soon. As devices boast increasingly similar specs, free software is just another way to get a customer’s attention, and hopefully, their business. How much do I have to pay to avoid this $500 of crapware? I’ve got 50gb of Box free forever with my LG G2 not for 6 months.